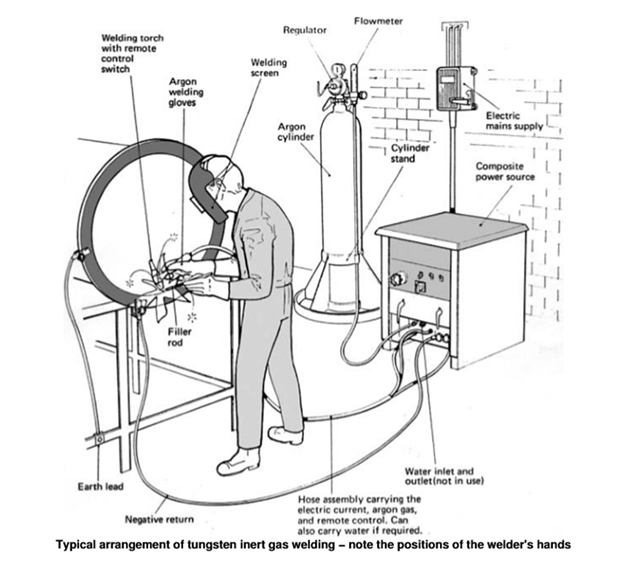 GTAW is also known as TIG welding (Tungsten Inert Gas). The filler metal is supplied from a filler wire and is similar to the metals to be welded. The tungsten electrode is not consumed in this operation and the shielding gas is usually argon or helium or a mixture of it. 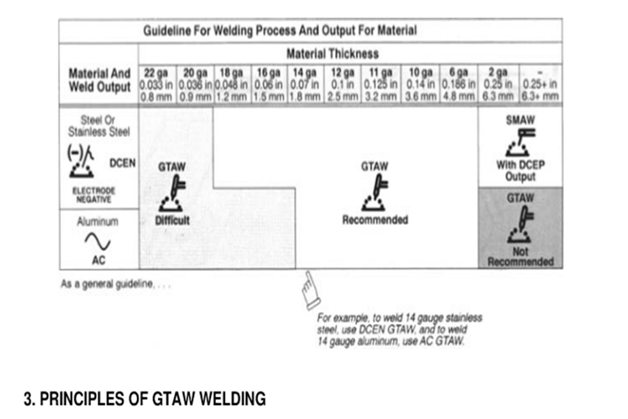 Welding with GTAW can also be done without filler metals, as in welding close−fit joints. The cost of the inert gas makes this process more expensive than SMAW, but it provides welds with very high quality and surface finish. In gas tungsten−arc welding (GTAW), formerly known as TIG welding (for tungsten inert gas), the filler metal supplied from a filler wire (because the tungsten electrode is not consumed in this operation, a constant and stable arc gap is maintained at a constant current level. The metal is similar to the metals to be welded, and flux is not used. The shielding gas is usually Argon or Helium, or a mixture of the two. Welding with GTAW is done without filler metals, as in welding close−fits joints. The power supply is either DC at 200 amps. Or AC at 500 ampere. Depending on the metal to be welded. In general, AC is preferred for aluminum and magnesium because the cleaning action of AC removes and improves weld quality. Use table to help select the proper welding process for the type and thickness of metal to be welded. As a general guideline, use AC GTAW (TIG) for welding aluminum/magnesium; use DCEN for all other metals. Use DCEP SMAW (stick) for welding most metal, and use DCEN for some stainless steel application. 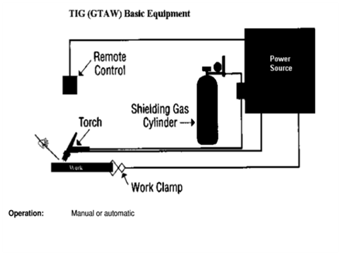 To prevent weld contamination and electrode deterioration the gas shield must (a) prevent atmospheric contamination of the weld and (b) not react with molten or solidifying weld metal or the tungsten electrode. Electrodes are made from tungsten and contain small percentages of either THORIUM or ZIRCONIUM. These additions ensure better arc striking ability and stability. Thoriated tungsten electrodes should be used for DC welding. Zirconiated tungsten electrodes should be used for AC welding, and are particularly suitable for welding aluminum and its alloys and magnesium and its alloys. − 1 % Thoriated tungsten electrodes have a BLUE tip. − 2 % Thoriated tungsten electrodes have a RED tip. − 1 % Zirconiated tungsten electrodes have a BROWN tip. GTAW is used for a wide variety of metals and applications, particular aluminum, copper, brass, magnesium, titanium and high alloy metals. It is especially suited for thin metals. In general AC power supply is preferred for aluminum and magnesium because the cleaning action of AC removes oxides and improves weld quality. DC power supply is also possible. The tungsten inert gas process can be used for welding aluminum, magnesium, stainless steel silicon bronze titanium, copper and copper alloy, and wide range of different metal thickness in mild steel. Top quality welds made in the above metal need little, if any, cleaning after welding period. TIG Welding is most often used for joining aluminum from 1/32 inch to 1/8 inch (0.79 to 3.2 mm) thick. Although heavier sections can be joined by TIG welding, other processes are usually more economical. TIG welding is an easy method of joining metals that are considered hard−to−weld, and filler and base metals can be easily matched. With TIG welding, strip of scrap parent metal may be used for filler metal. 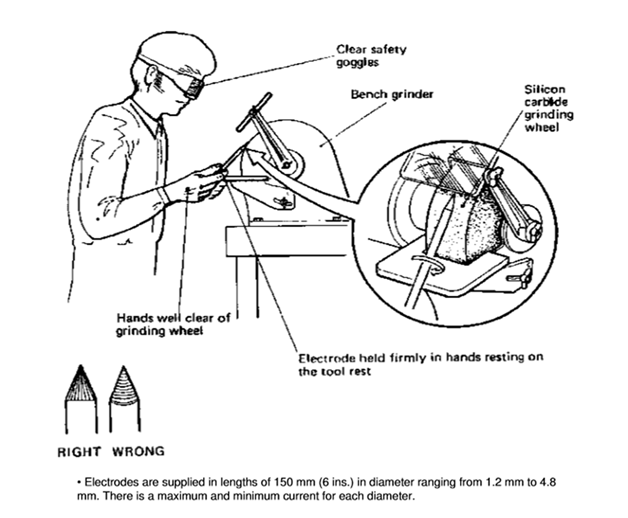 Post−weld machining, grinding, or chipping can usually be eliminated due to the easily controlled weld reinforcement. The need for flux is eliminated, even on hard to weld metal such as aluminum.